The Round Top Family Library opened its doors in 2000 and is situated on an approximately 2.5 acre site. Round Top Library Association Inc. has purchased the land & Rummel Haus from Bybee Foundation. Rummel Haus restoration is a project at this time. Today the facility is composed of two buildings, including the historic Rummel Haus which hosts a variety of Library programs. The larger building, called the Sterling & Marianne McCall Library Building, was formerly the Hope Lutheran Church, a historic gothic building first constructed in 1925. It was dismantled and moved in seven pieces from Milam county to Round Top and immaculately restored. The project was made possible by a generous gift from Sterling and Marianne McCall. The historic Rummel Haus has been restored and refurbished to serve as an activity center. It’s used on a regular basis for children’s art classes, Junior Master Gardener training, Book Club, and Library Board meetings. It is also available for community meetings and private social, non-commercial events. Click the button below to see pictures, view the Rummel Haus history, and access the reservation request form. 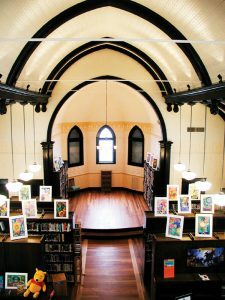 As a lending institution for children, families and adults, the Round Top Family Library’s purpose is to serve diverse community segments and visitors, in non-traditional ways. 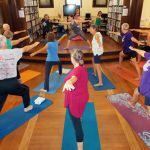 Innovative programs, and community projects for all ages are available in this community center for learning and enrichment. Here, patrons and individuals of varied backgrounds are accommodated in a warm and inviting atmosphere where they may meet, learn, connect to each other, and to the world at large. Round Top, Texas is a historic community in Fayette County, Texas that has been named one of the “Top 100 Arts Towns in America”. With a population of 90 full time residents, it has an outsized reputation for its extraordinary arts attractions, its annual Fourth of July parade and its twice annual Arts and Antiques events. 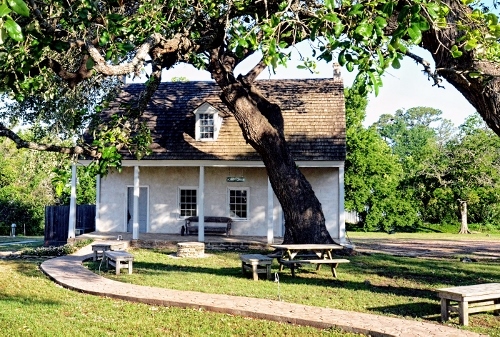 In addition to being the smallest incorporated town in Texas with a full service public library, it is the home of the internationally regarded Festival-Institute at Round Top, and Shakespeare at Round Top, a program at the Winedale Historical Center whose students have twice performed at the Globe Theatre in London. The historic buildings in the center of town are protected by a local historical district. Round Top is also the smallest Town in Texas with a Land Use and Architectural Controls Ordinance. Located beside Cummins Creek near the eastern boundary of Fayette County, Round Top was first known as “Townsend Settlement” after a family of early settlers in the area. It was also referred to as “Jones Post Office” after Myers F. Jones, the first postmaster. Round Top is entirely situated on one square mile of land taken from a league of land granted to James Winn on March 31, 1831. It is unclear when the town first began to be known as “Round Top.” Records indicate it was before 1850. Stories claim that it was named after a local house and stagecoach stop that had a “round top” where settlers would watch for the stage on the chance that it needed defense from hostile Indians. The first settlers were predominantly Anglo-American and many distinguished themselves in the Texas War of Independence. Joel Robison, a local man, captured an older Mexican officer after the Battle of San Jacinto. Feeling pity for the vanquished man, he allowed him to ride on the back of his horse on the way back to where the prisoners were held. As they rode along the road, the other Mexican troopers began to salute and show great deference towards the older officer. It turned out that he was Santa Anna, the Dictator of Mexico. In gratitude for his gentle treatment, the Mexican leader gave Mr. Robison his gold braided vest. For years, young men in the Round Top area wore the vest on their wedding days. 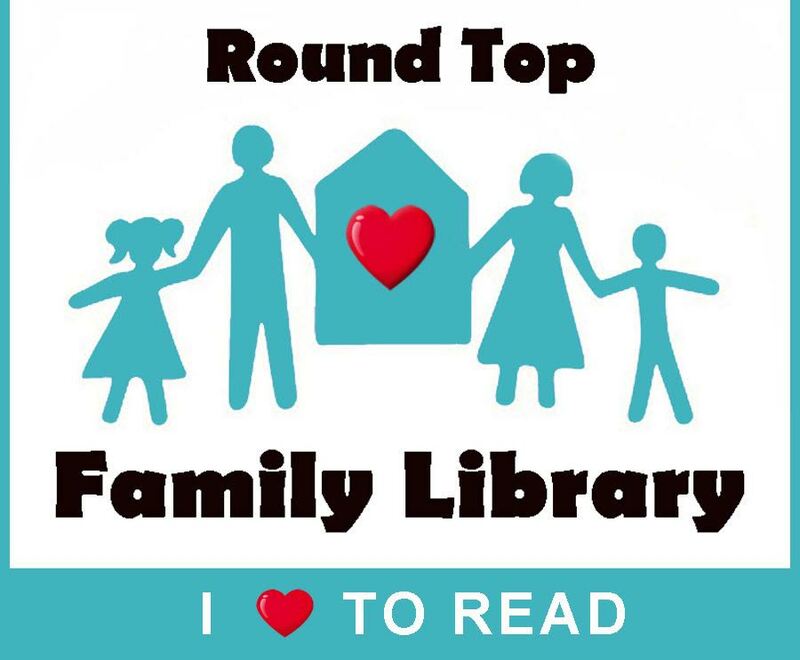 Since its founding, the Round Top Family Library has been blessed by exceptional leadership, both from its Director and Staff, its Board of Directors, Advisory Board and Volunteers. In fifteen short years, the institution has grown from an underfunded tiny children’s library in the historic Rummel Haus that existed only because it was given a 30 year lease for $1.00 per year, to a certified public library and community center whose grounds and elegantly restored historic buildings are debt free. Our programs have expanded and diversified far beyond our early dreams. That was only possible with the hard work and wise leadership of many people. Ms. Barbara, as she is lovingly known, was for many years the Elementary School Librarian at Round Top Carmine Schools. When she retired, she was invited to serve on our Board of Directors. At that point in the Library’s development, we had received the incredible gift of the Sterling and Marianne McCall Building, but were having growth pains because without an endowment or significant public support, the Library was living almost month to month. Not long after she joined our Board, she was “called by her maker” to lead the operations of the Library. She immediately began cost-cutting and using her relationships with the local community to lead us beyond those hard times. She has now become the “true heart” of the Round Top Family Library. Every day we thank our lucky stars that she never got around to retiring. Mary Leitko has held the post of Children’s Program Manager at the library since 2013. She has attended schools in California, Nebraska, Florida and Texas but feels her real education comes from being a student of life. Mary is responsible for creating and implementing children’s after-school programs during the school year and for the busy eight-week summer program schedule. Pat Cox has worked at the library since 2010. In addition to bookkeeping and front desk duties, Pat leads the library book club and is library liaison for the FYI program series. Keelia Ritch has been a staff member since 2014 and is a daily presence at the front desk. Keelia handles publicity and advertising for library programs and special events. She also leads a library program teaching yoga to children at the local elementary school. 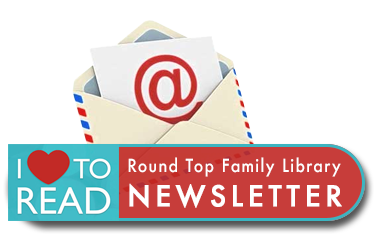 Keelia will manage much of the updating of the new Round Top Family Library website.